June, the first true summer month, always reminds me of childhood summers in England with afternoon tea in the garden on a tray table under the apple tree. 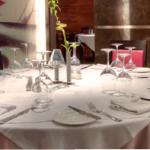 In Malta too, it is a sweet month to savour before summer hits big time and cicadas deafen our sultry siestas. 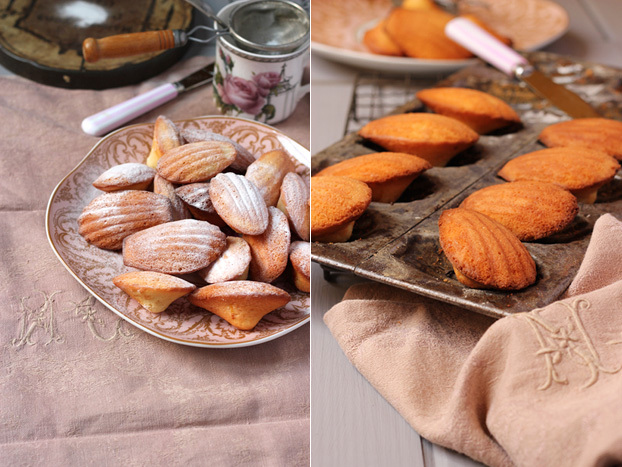 French-style Madeleines echo the simple pleasure of these early summer days. 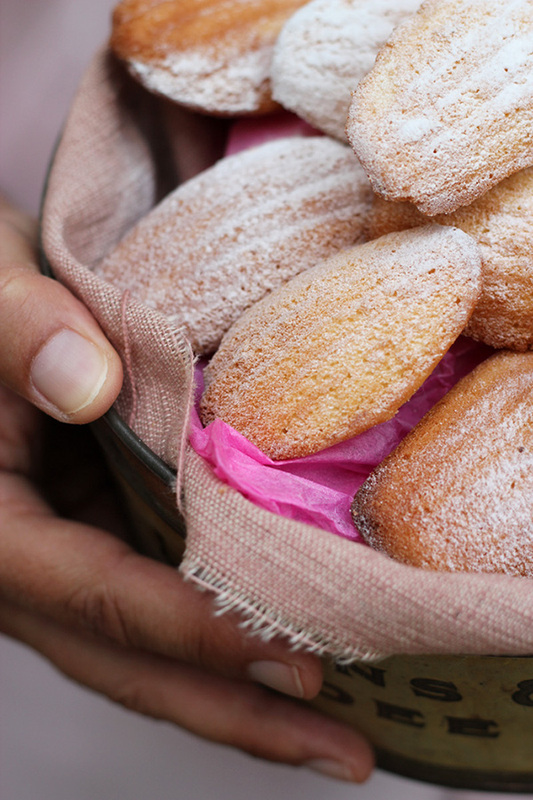 Instead of the Victoria sandwich cakes of my childhood summer teas, I made these mouthful-size Madeleines as our weekend treat. I bought a vintage Madeleines tin from eBay in the winter and have been waiting to put it to the test. The tin has probably seen a good few batches cooked up in its time as it shows a patina of wear and tear. 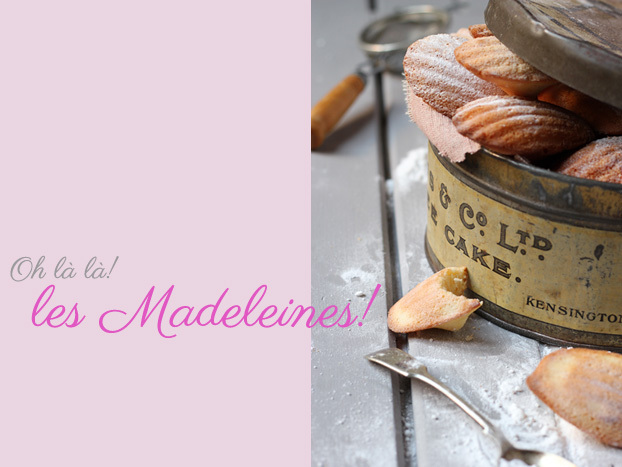 I wonder for whom and where its Madeleines were made in its past life? 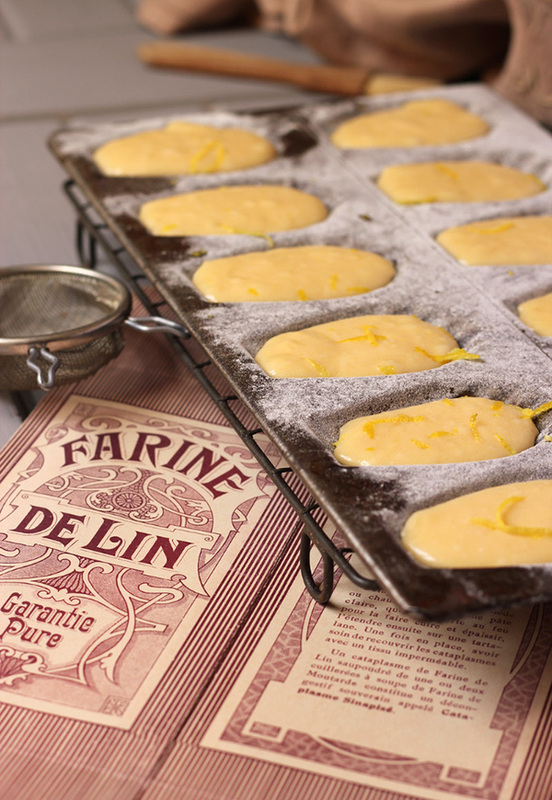 Exploring Madeleine recipes, I discovered that while seemingly simple little scallopy sponges, these melting moments of buttery delightfulness do have their foibles and can be a bit hit and miss to get perfect, or right first time. 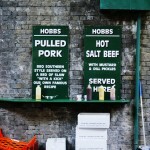 It’s all about the hump – whether you wish to have a large rising sponge or a slimmer number. Add baking powder of an haut qualite’ only of course, and you get hump. But purists say the baking powder gives them an rough after taste and detracts from their buttery sumptuousness. As with most French pastisserie, simplicity in looks is deceptive; under the bonnet lie methods to perfect, split seconds to get it right in, and long years of experience of an accomplished pâtissier. None of which I boast in my culinary C.V. So, a first-timer using an ancient Madeleines tin. Perhaps its experience would rub off on me? As I dolloped in the batter (tin and batter both chilled for some time in the fridge – another trick of the Madeleines trade), I wished I’d bought a new, non-stick number not the somewhat rust-flecked oldie, however beautiful a piece of kitchenalia. A Victoria sponge could be up and running in around half an hour, I thought, as I embarked on the madness of a Gallic alternative in an uncharted tin. Luck was on my side – thanks tin! Doing one batch at a time, I worked out that the first batch would stick, but that the second might fare better with some of the butter residue from the first. Just as the first pancake never turns out right. This was exactly what happened. So, if you are a sucker for ancient tins, count on making double mixture and doing a trial run. Did I use baking powder? I did for this lot. No time to whip up two batches today to trial out both methods. But as they went like hot cakes (that they were) and left the plate almost before making it to the garden for a proper tea, I guess the baking powder method works just fine. Just note, that these time-honoured classic cake-lettes need time; factor in those hours of tray and batter chilling with some chill-out time all your own. They are worth waiting for. Ironically, I stored the oh-so-French and feather-light Madeleines in a classic British cake tin made once for a heavy-weight Dundee! Recipe adapted from ‘The Sweet Life in Paris‘ by David Lebovitz, an American in Paris who’s a pastry chef, blogger and author. 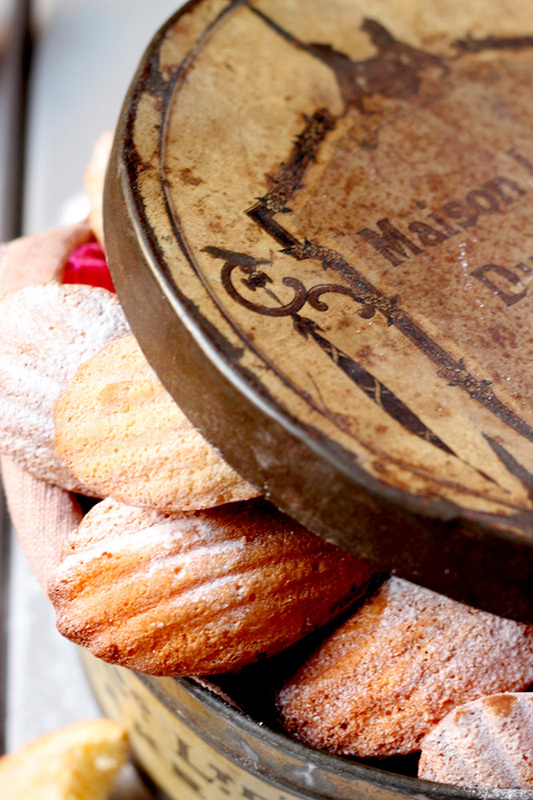 Makes around 30 if you use traditional Madeleine tins; you could also use cupcake cases. best eaten as ‘hot’ cakes a few minutes after turning out, but they keep in air-tight tin for up to three. They go very slightly chewing when a day old, but are ideal to nibble with morning coffee. Fresh, they are perfect for tea! First prep your tins by melting the butter required in the recipe and smearing it lightly in the molds/tins. Dust tins with flour and shake of excess. If using silicon trays, you won’t need to do this stage. Then, chill the tins in your freezer for a minimum of an hour, but preferably three. Using a mixer, beat the eggs, vanilla essence and sugar til frothy and thickened. Sieve the flour and baking powder (if using) and fold in a couple of spoonfuls at time into the egg mixture. fold in the lemon zest and juice. Combine well until no dry bits are left. Pour in the melted butter slowly a little at a time (having left it to cool) and stir it in gently, combining well. Cover the batter and chill in the fridge for a good 3 hours, and anything up to a day. When ready to cook, preheat oven (fan) to 180°C. Spoon the batter into the tins (or paper cases) fill around ¾ of each scalloped mold or case. Don’t fuss around smearing it smooth; see if you can scrape it off the spoon using back of another spoon all in one go. Bake for 8-9 minutes or until very lightly golden and just firm to touch. They cook very fast. If you’ve used baking powder, expect quite a ‘bump’ to rise on the tops! 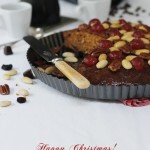 Turn out of tin asap you can, so don’t leave to cool in the tins. They should slip out with a little tap, as you tilt the tin over a wire cooling rack. they look delicious. It is something that I have never made. I might need to look for a tin and have a go, thanks for the great tips. I’ve been missing from your page for a while, and I am glad to be back visiting today. Have a wonderful week – and happy summer! Hi Jill, thanks for your ongoing support and encouragement! 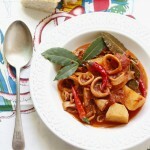 I must pop by your blog too soon as your photos are wonderful and give me an Antipodean view of food! eBay the place for vintage – I expect the same on Australian eBay too. Hope autumn not too cold yet? Only just edging into a real Med summer here as it’s been a weird spring weather wise.